The New York City Press conference to announce the Heavyweight title clash between WBC champion Deontay Wilder (40-0-1, 39 KOs) and Dominic Breazeale (20-1, 18 KOs) was a feisty affair. Both men have a long lasting feud that stretches far beyond the squared circle. In 2017 the two fought on the same card and both picked up impressive victories. Breazeale’s coming against then Izuagbe Ugonoh and Wilder’s coming against Gerald Washington. Ironically enough both men scored stoppage victories in round five. Sometime after their contests they got into a dispute that ended in a bit of a tussle. Ask both men what happened and they will both tell you completely different stories. Regardless of what they have been saying, the time for talk is over as they will be squaring off on May 18 at the Barlcays Center. Wilder has become a staple at the Barclays as it has become some what of a de facto home for the Alabama native. The WBC champion expressed his admiration for the venue as well. “It’s a blessing to be back in Brooklyn and back at the Barclay Center. You know how dear this place is to me. I’ve been here so many times. Out here they call me the Bronx Bomber instead of the Bronze Bomber and I love it. I’m looking forward to fighting here again.” Said Wilder. Seems as though it was a calm press conference doesn’t it? Think again. These two bohemians wasted no time expressing their dislike for one another while also giving warnings of what exactly will happen come fight night. “I finally get a chance to get this chump in the ring. I’m tired of hearing you talk. It’s time to get in the ring and square off.” Said Breazeale. In the world of boxing it is common place that two fighters don’t like one another but normally there is a healthy level of respect. For Breazeale however there seems to be none there. The war of words didn’t stop there as Breazeale explained just how elated he was when he found out that Wilders younger brother Marcellus was knocked out earlier this year. There is absolutely no love and no respect shown between these two. In the words of Breazeale, Wilder does everything wrong. But how do you prepare for someone that is so unconventional? For as much as Breazeale poked fun at Wilder’s expense he made it clear what he intends to do come fight night. According to Wilder Breazeale deserved everything that happened to him on that night in Alabama. Whenever Deontay Wilder speaks to the media it is impossible to not address the elephant in the room, meaning Anthony Joshua and Tyson Fury. Wilder made it clear that he is not chasing anyone. With all of the animosity that was spewed during todays press conference it is safe to say that fans can expect fireworks come fight night. 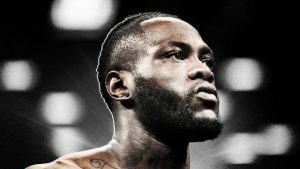 The post NY Press Conference Notes: Wilder vs. Breazeale appeared first on BoxingInsider.com.